As we head into the holiday weekend, you will undoubtedly notice an area of soon to be dead turf in the middle of #14 fairway. 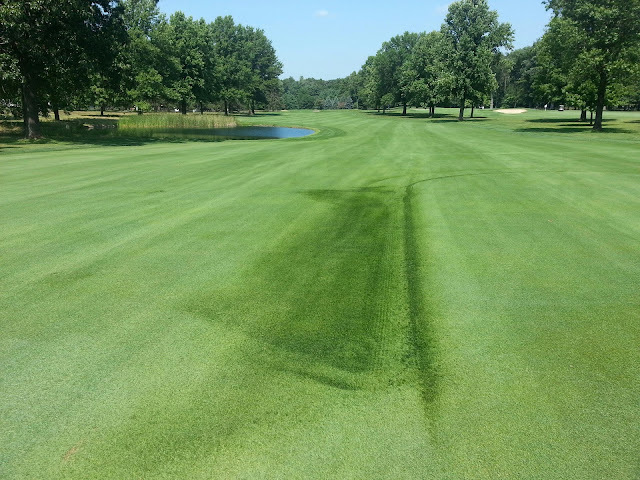 This was caused by a blown hydraulic hose on one of our older fairway mowers. Since we are scheduled to aerify fairways next week, the repair to this area will have to wait until after the aerification process is complete. Luckily we have plenty of sod on our nursery. Like the title says, there’s never a good time for this to happen. The popular motto “defense wins championships” rings true, not just in sports, but in turf management as well. It’s not necessarily what we do when the heat and humidity arrives, but more about what we don’t do. For example, a majority of the month of August brought drier and cooler weather that allowed us to play offense and push the turf to provide some great summer playing conditions. We have just finished a stretch of Invitationals, various Club Championships, the Boys and Girls Club Ryder Cup event and a PGA Section event where, in my opinion, the club and golf course were at peak conditioning. Now, as we work through our second hot stretch of the summer, it is time to play defense. The height of cut was raised slightly to increase the amount of leaf tissue on the plant giving it a better opportunity to generate the necessary energy to survive, mowing days are occasionally skipped and replaced by rolling to reduce stress and irrigation is kept to a minimum. The need to minimize the amount of irrigation may sound counter-intuitive because of the heat, but we need to reduce the possibility of various types of diseases from developing. Moist soils, thatch and leaf blades make an ideal environment for pathogens to grow and create harm to the turf. 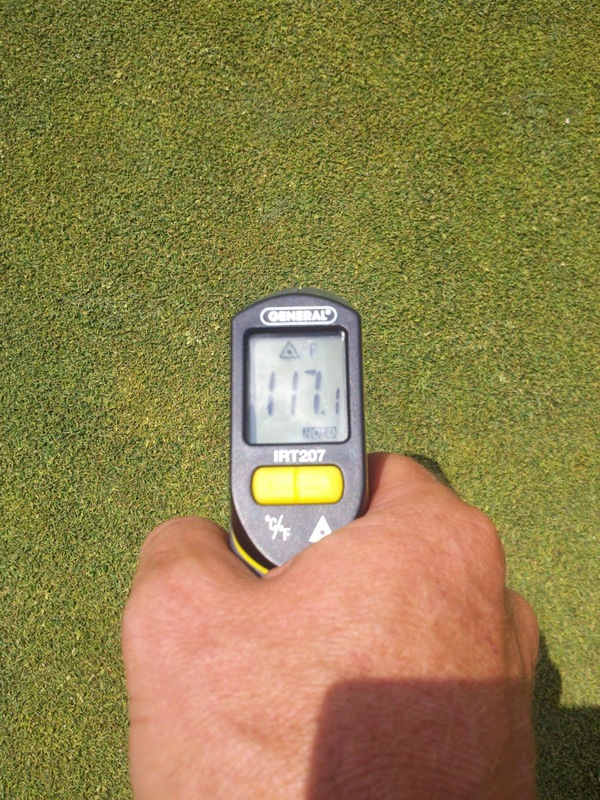 By reducing the irrigation, we reduce the moisture available to the pathogen. 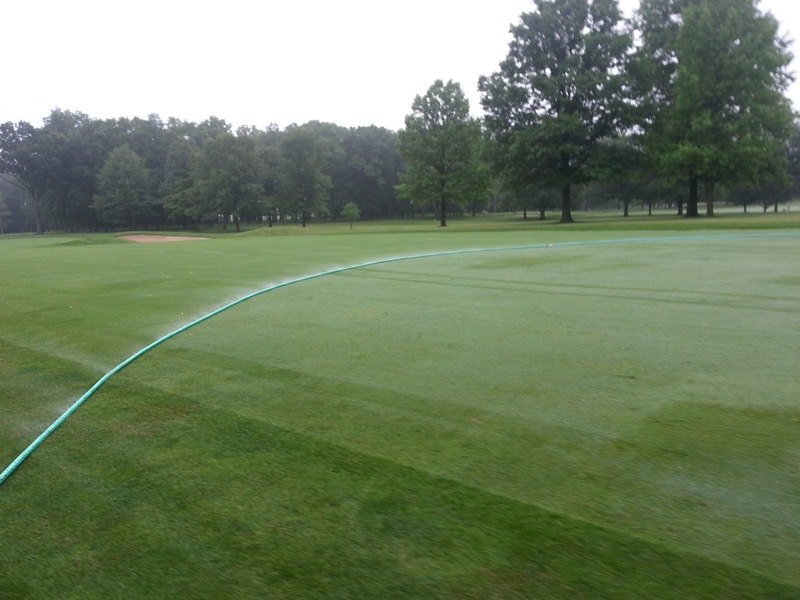 On days when we don’t mow fairways the dew is mechanically removed by two carts dragging a long hose across the playing surface to knock the dew off of the leaf blades allowing them to dry more quickly. In periods like this, every little trick helps. The two uncontrollable wildcards are the humidity and rainfall. That is where our plant protectants (fungicides) come in. My general philosophy is not to apply these products unless it is absolutely necessary or if conditions warrant the need for them to be applied. Obviously, during periods like this, there is certainly a need to make applications to protect the turf and allow it remain as healthy as it can. Because of this, our sprayers have been quite busy over the course of the last week or so. Extremely high canopy temperatures. 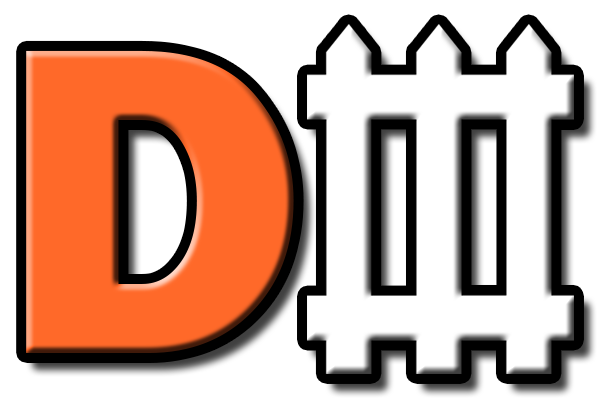 Time for Defense! By combining all of these practices, it allows us to pick up where we left off as soon as the weather becomes a little more seasonable again. Rest assured, the conditioning of the golf course remains our top priority, that’s why we take these necessary steps. I was quite pleased the other day when some of you actually approached me and were inquiring as to whether we would be going back on defense during this period of hot/humid weather. I wasn’t just pleased because interest was being shown in what we do, but more so with the fact that my previous communications through newsletters and the blog are being read and understood. For that I say “Thank You”! Throughout the year, particularly during stressful times of the season, I enjoy reading fellow superintendent’s blogs. One of my favorites is the one my friend Chris Tritabaugh at Hazeltine National (hosting the 2016 Ryder Cup) has put together and updates quite frequently. He just posted a similar message to his membership and I felt you would enjoy reading it. It can be found by clicking here. It’s well worth the read and I’m sure you will see a common theme between our two posts. Enjoy! 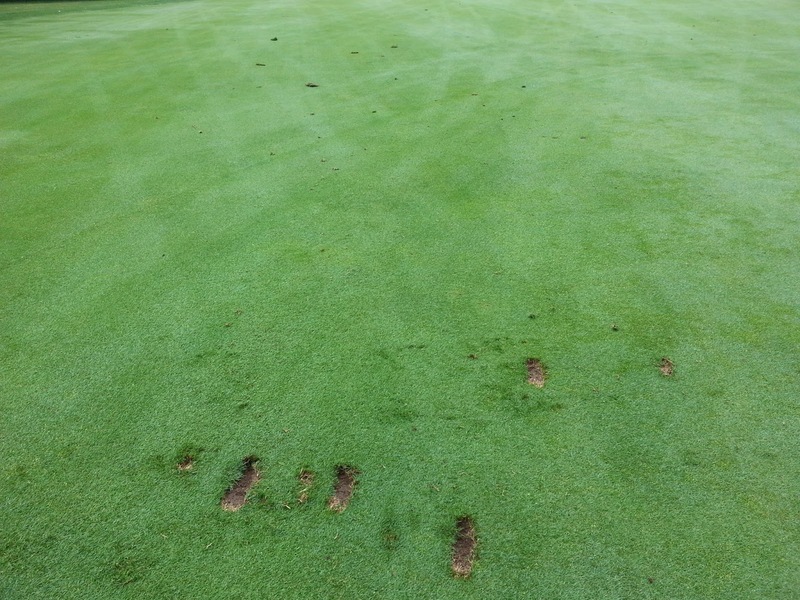 Over the last few weeks I have had several questions regarding replacing divots in the fairways. Not specifically about how to replace them, but more in regards to why individuals are not replacing them at all. My honest answer to that question is that I don’t really know, but it has certainly escalated to the point where I feel like I need to give everyone a gentle reminder to make sure that they get replaced regardless of size or shape. I will also use this opportunity to remind you to please use the Practice Facility for practice and not our fairways (see photo below). The follow-up question always seems to be “Why don’t we have sand on the carts?”. 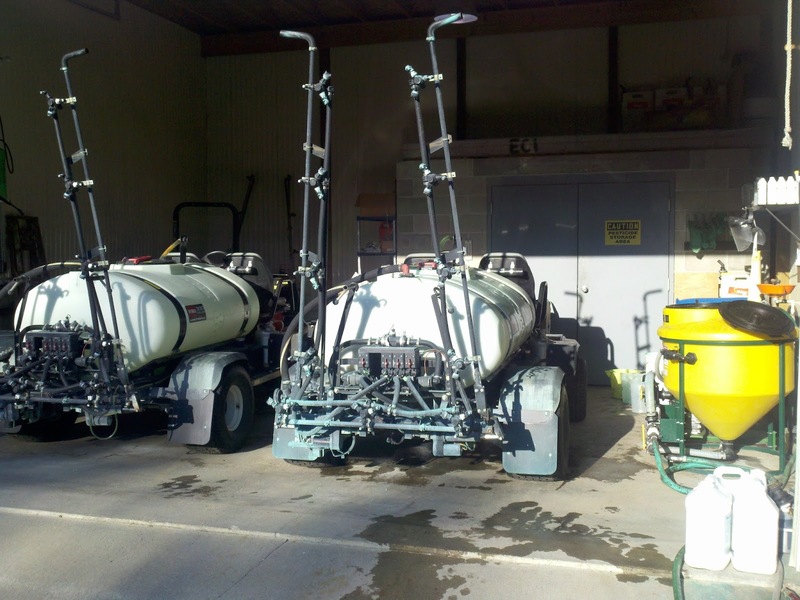 When sand is available on the carts, it is human nature to go to the quickest/closest solution. We have found that when sand is on the carts, there is very little, if any, attempt to retrieve a divot. A perfect example is the par-3 tees. 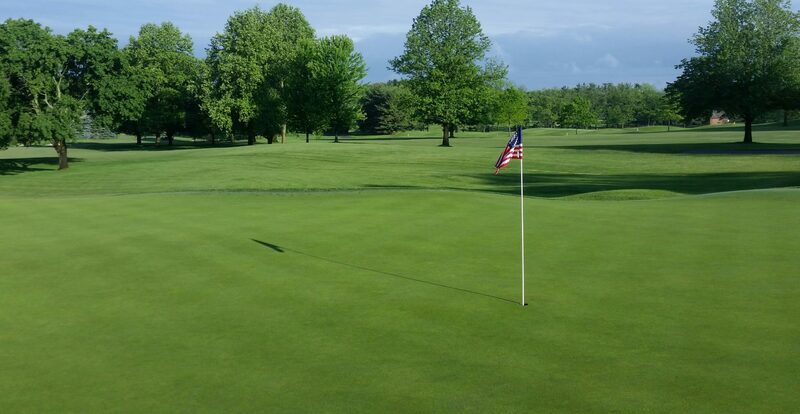 We provide sand for the divots, but how many divots are actually replaced? I won’t spend this entire post reviewing common course etiquette, but will refer you to a post from two years ago as a reminder. The post can be found by clicking here. Some of the agronomic references in the linked post don’t necessarily apply right now, but the basic concept of course etiquette still holds true. Below are some sample photos that I took this morning to use as an example to answer some of the questions about divots and ballmarks. 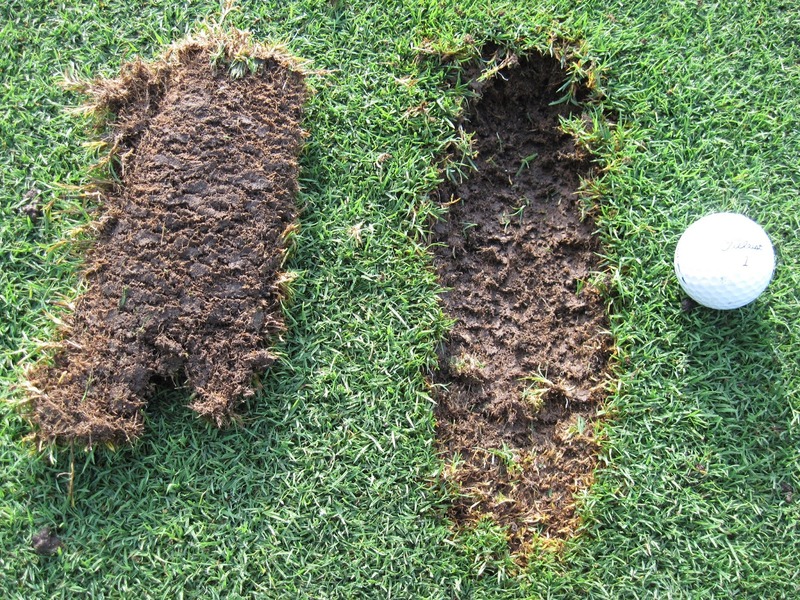 Fairway Divots: If the divot contains roots, it has a very good chance to survive. Regardless of size or shape, please replace any turf that is removed after a shot. 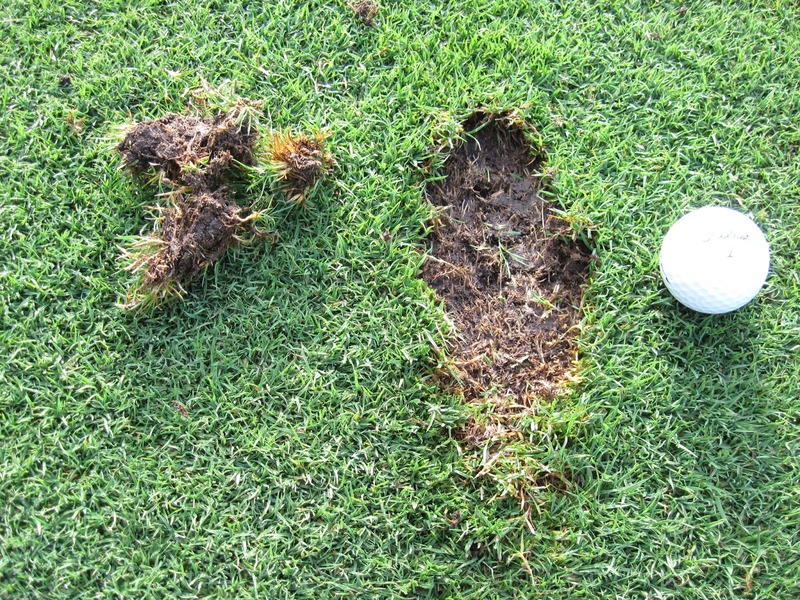 Not every divot will recover, but by replacing what is removed, it gives the divot the best chance for survival and also keeps the course clean and minimizes the damage to mowers from divots that are not replaced. 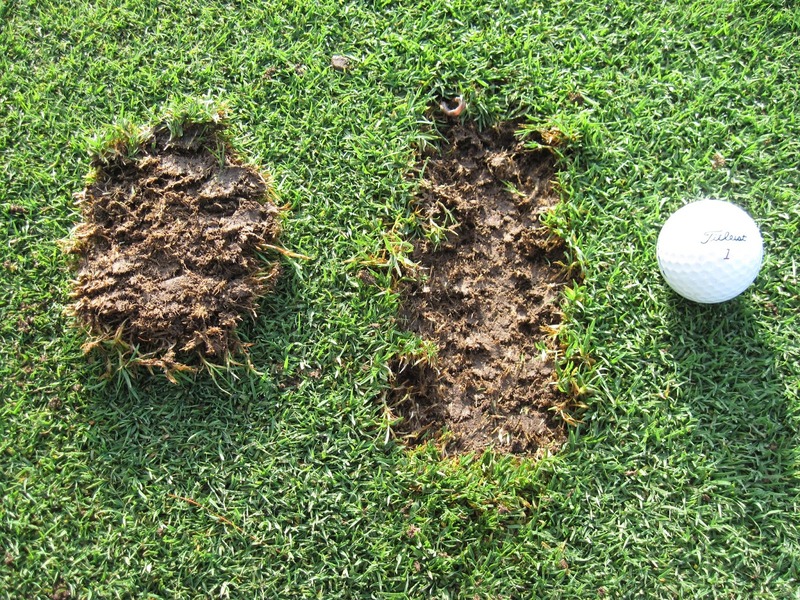 Large, deep divots have a very good chance for survival. depends greatly on the weather. 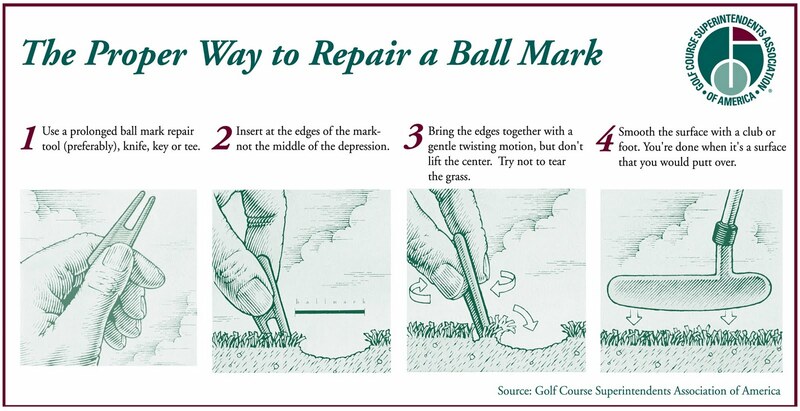 Ballmarks: it takes approximately 5 seconds to properly repair a ballmark. A properly repaired ballmark will completely heal in 24 hours. 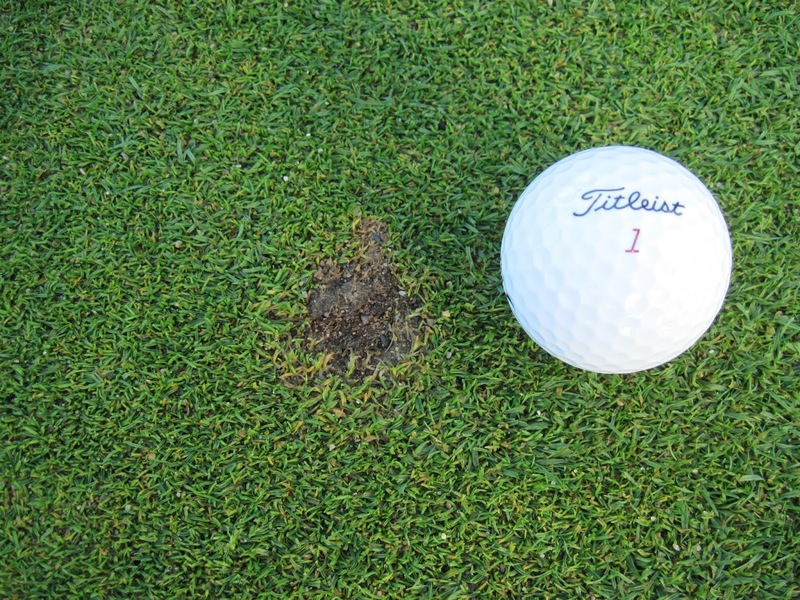 An unrepaired / improperly repaired ballmark will take 15 days to recover on its own. Note: Never push down on your repair tool to bring soil to the surface.